Over the last decade, there has been a growing interest in both celiac disease and gluten intolerance or sensitivity. Doctors have become more aware of the prevalence of celiac disease, and patients have become more conscious of the fact they can have a negative reaction to gluten even if they don’t have celiac disease. Many people react to gluten by producing elevated IgG or IgA antibodies to gluten or wheat (not to be confused with elevated antibodies found in celiac disease), but they do not have damage to the small intestine indicating celiac disease. Celiac disease is a very specific kind of gluten intolerance and most people who react to gluten do not have celiac disease. Celiac disease occurs when there is a particular kind of damage that occurs to the villi in the small intestine. This damage is called villous atrophy. Other than the villous atrophy, there is often very little difference between celiac disease and other forms of (non-celiac) gluten intolerance (often called a gluten sensitivity) in terms of symptoms or reactions to the ingestion of gluten. Non-celiac gluten intolerance can cause just as many problems as celiac disease and be just as severe. To add to the confusion, many people call a non-celiac gluten reaction a gluten allergy. None of these words is wrong, and you should use whichever one you are comfortable with or you feel gets you the response that you need in order to stay healthy. Anyone who tells you that you are wrong is misinformed. When someone tests negative for celiac disease but has an obvious reaction to gluten, they often become quite frustrated with traditional medicine. Many doctors tell them their negative test results mean they are not allergic or intolerant to wheat, barley, or rye, yet when they eat foods containing those ingredients, they become sick. Trust your instinct. In most cases you are able to assess these types of reactions much better than your doctor. Gluten is a protein that is found in many different grains, including wheat, spelt, kamut, farro, rye, and barley. If you are sensitive to gluten, then you are sensitive to all of these grains and to anything made from any of them. Gluten is found in nearly all bread products and pastas (including orzo) as well as in most breakfast cereals, cookies, muffins, cakes, soy sauce, pancakes, waffles, soups, couscous, sauces, and gravies. Beer, ale, lager, and stout contain gluten. Malt and malt extract, which are used to add flavor to a wide variety of foods, contain gluten. Be careful since gluten can hide. There can be gluten in the fillers of some medications and other items you ingest. You should read all labels and ask questions about anything that you don’t understand. This is just a small sampling of the kinds of symptoms that can be triggered by a gluten intolerance. And the severity varies as well. Some patients have problems resulting from a reaction to gluten severe enough to land them in the hospital. Many people have gluten sensitivity problems that interfere with their work and social life. Celiac disease causes a specific kind of damage in the small intestine known as villous atrophy. The villi, which are the tiny tentacles that line the wall of the small intestine, erode away and leave a flat surface behind. Without those villi, the body cannot absorb nutrients correctly, potentially causing nutritional deficiencies. When people with celiac disease eat foods with gluten, the immune system triggers an autoimmune reaction, leading to the atrophy. Gluten intolerance can also cause many other symptoms many people do not often associate with diet. Behavioral problems, psychological difficulties, and some neurological disorders can be due to gluten sensitivity. Many people report depression or anxiety that cease once they stop eating gluten. Others notice dramatic changes in their kids who once had attention issues, irritability, poor grades, or poor social skills. As for neurological issues, gluten can cause white lesions in the brain, tics, seizures, and mobility issues. Some patients report being able to get rid of their canes or walk away from wheelchairs after they stopped eating gluten. It sounds miraculous, but this has been seen in the clinical setting. Gluten sensitivity can exacerbate many problems including other autoimmune conditions like Hashimoto’s thyroiditis, Lupus, Sjogren’s, and Scleroderma. Anyone with any autoimmune condition should strongly consider the possibility that gluten may be a trigger. It is also possible to have a gluten sensitivity or celiac disease without having any symptoms at all. Many people with celiac disease do not appear to suffer from it, yet. Of course, in either case, gluten is still causing harm. The same is true for non-celiac gluten sensitivity. If your lab work is positive, then you’re having a reaction, whether you like it or not. People who have celiac disease vary widely in their symptoms. Some have diarrhea, some have constipation, and some don’t have any digestive problems at all. In reality, few present with the classic symptoms once thought to be required in celiac disease. Some celiacs have headaches, and some have osteoporosis. Some have skin problems, and some only have fatigue. But a great many of them have no symptoms whatsoever. A large percentage of people with celiac disease have no discernible symptoms, except for their villous atrophy. They don’t feel or look sick. Several studies have shown this, and it means celiac disease isn’t always severe. In reality, people with celiac disease cover the spectrum, from feeling reasonably well and living normal lives to being in the hospital. That certainly puts a hole in the “celiac disease is always worse than gluten sensitivity” theory. Most people will tell you that we don’t know much about gluten sensitivity. 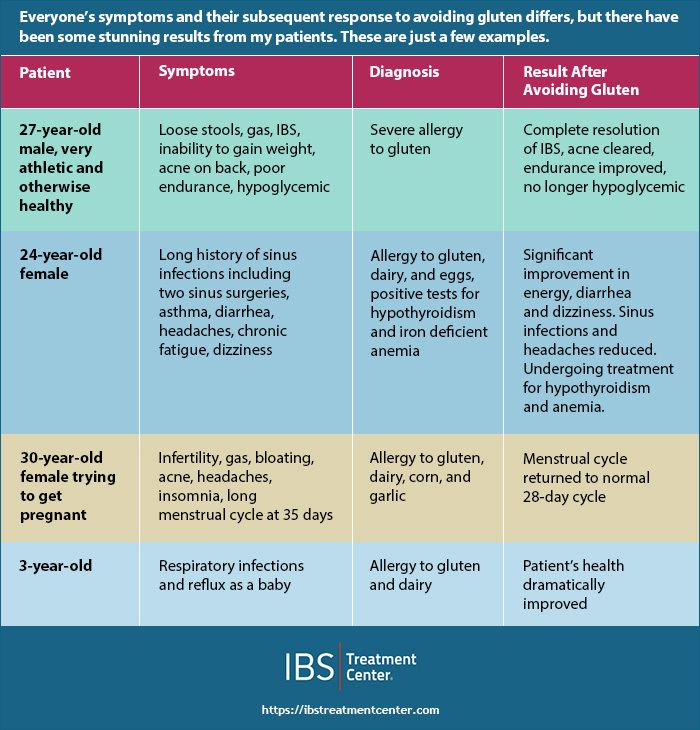 However, after working with thousands of patients and assessing each and every one of them for gluten sensitivity, I’ve learned a few things. I’ve seen numerous patients who have spent significant time in the hospital and had multiple ER visits, yet nothing abnormal was found. They had extreme abdominal pain, yet they did not have appendicitis, gallstones, cancer, or any other malady that can be diagnosed with a CT scan, MRI, ultrasound, colonoscopy, upper endoscopy, or any other diagnostic procedure used at a hospital. They didn’t have celiac disease either. Most of them had been tested for it more than once. As we began to dig deeper, it often turned out that they had a gluten sensitivity and/or reactions to other foods. Once they removed the offending foods from their diet they began to heal and now live without pain, discomfort, or other symptoms. These gluten sensitive people were just as sick as any celiac patient. The main point is that it is impossible to predict whether or not someone has celiac disease based on their symptoms. It is also impossible to predict whether or not someone is otherwise gluten sensitive based on their symptoms. The only difference is the presence of villous atrophy. Celiac disease is a symptom, just one potential manifestation of a reaction to gluten. It’s not the worst symptom, nor is it the end stage of a gluten reaction if you happen to be gluten sensitive. In my office, I run a full panel of IgE, IgG, and IgA antibodies for about 100 different foods and food components to test for gluten sensitivity. I regularly see elevated antibodies to gluten, gliadin, wheat, barley, rye, and spelt. A positive test for any of these foods indicates a patient has an immune reaction to those foods. The people coming to see me may have had digestive symptoms such as constipation, diarrhea, IBS, gas, bloating, or heartburn, or they may have any number of other symptoms, such as fatigue, headaches, arthritis, chronic sinusitis, eczema, etc. Once they eliminate the offending foods from their diets, these patients invariably begin to feel better. You don’t necessarily need a blood test to find out you have a reaction to gluten. There are many people who discover through trial and error that eliminating gluten from their diet helps them to feel much better. These people often have not undergone any testing and there usually isn’t any point in testing them, since any test for celiac disease or gluten intolerance will typically be negative once a person has stopped eating gluten for a while. Asking someone to eat gluten for at least a month so I can verify their gluten intolerance seems illogical when you consider how ill that usually will make them feel. Some people find they cannot tolerate gluten, but they do not test positive on any of the tests used to diagnose celiac disease. These tests include the biopsy of the small intestine, and tissue transglutaminase or deamidated gliadin antibody tests. This is a common occurrence and one I frequently see in my office. Notice I did not say that they do not test positive for gluten intolerance. In fact, most of these people do have test results indicating they are gluten intolerant, even though they do not test positive for celiac disease. While we support patients taking responsibility for their health, getting proper testing can be a big factor in successful treatment. Not having the test results and professional guidance makes it more likely patients will not be diligent about avoiding gluten. The treatment is identical for both celiac disease and gluten intolerance. The goal? Remove all sources of gluten from the diet. Many people treat them differently and consider celiac disease to be more severe and therefore consider the dietary avoidance to be more complete. However, in my experience they can be equally severe, and therefore I treat them the same. If you are allergic to gluten, then the result of removing gluten from your diet is generally a reversal of your health problems. Symptoms very often resolve, some faster than others, and you gain a new definition of optimal health. Even celiac disease is reversible, usually resulting in complete recovery of the damage to the small intestine. A person with a gluten allergy should not eat bread products, pastas, or processed food of any kind that contains wheat, rye, or barley in any form. Dietary counseling can be helpful for many patients and fortunately, there are many alternative sources for gluten-free breads, pastas, and other foods. They are easier than ever to find. 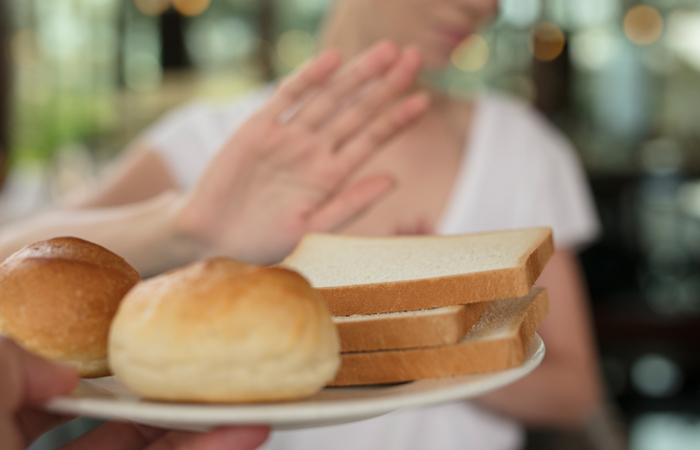 If someone choses to continue eating gluten if they have a known intolerance or celiac disease, they will continue to suffer the symptoms their gluten allergy is causing. There are also long-term consequences and they can be severe. People with celiac disease are known to be at higher risk for many conditions, including cancer of the digestive tract, thyroid problems, anemia, osteoporosis, and many autoimmune conditions. If you are already avoiding gluten but not feeling much better, you are not alone. This is far more common than most people realize. Maybe avoiding gluten has solved some of your problems, but not others. Or maybe it hasn’t solved anything at all. This can happen whether or not you’ve been diagnosed with celiac disease, a non-celiac gluten intolerance, or simply cut gluten out of your diet as an experiment. Regardless, there is a logical explanation, and it isn’t necessarily as simple as saying you must be getting some gluten contamination. Avoiding gluten can provide wonderful results, but when it doesn’t, or leaves a lot of room for more improvement in your health, it’s important not to give up. Of course, you want to thoroughly evaluate your diet for hidden gluten. But you also need to consider other causes. For example, gluten may not be your only food intolerance or allergy. It is common for people who are gluten intolerant to react to one or more other foods. It’s also common to have an imbalance in the ecosystem of your digestive tract. This can involve bacterial overgrowth, yeast overgrowths, deficiencies in good bacteria, and even parasites. Even though you are diligent about avoiding gluten, accidental intake often happens. My wife once prepared a dish she had made several times. About an hour after dinner, I started to get diarrhea, which is my first dramatic reaction whenever I ingest gluten. Not having had diarrhea or any other digestive problems for a long time, I immediately began to wonder why it was happening and began to try to track down the cause. My wife is usually very careful to not feed me gluten, and after a short discussion she realized she had used a new chicken broth we hadn’t used before. Upon checking the ingredients, we soon discovered it was the culprit. Buried about halfway down the list of ingredients was wheat. Fortunately, I had caught it relatively quickly and was able to do something about it. I took a product called GluDairyZyme, which is an enzyme specifically designed to digest gluten. It’s not a cure for gluten intolerance, but it’s great for accidents such as this one. In relatively short order I was feeling much better and by the next day didn’t seem to have any lasting side effects from eating wheat. Like many people who have been diagnosed with Irritable Bowel Syndrome (IBS), you may have discovered that you are gluten intolerant or maybe you have IBS symptoms and are wondering if you are gluten intolerant. IBS is a diagnosis given to people with chronic diarrhea, constipation, gas, bloating, abdominal pain, or a combination of any of those symptoms. The diagnosis of IBS can rule out potentially deadly conditions but being diagnosed with IBS only means your bowel irritates you, which you already know. At least 35-50 million people in the U.S. suffer from diagnosable IBS and studies have shown approximately three million people have celiac disease. Far more than three million people are gluten intolerant and exhibit symptoms such as IBS when they include gluten in their diet. In fact, many people who do not have celiac disease turn out to have symptoms caused by the consumption of gluten. We frequently see this situation at our clinic because not everyone who suffers from gluten intolerance has celiac disease. Fortunately, there are other tests than can illuminate exactly what is causing these symptoms. So, if you still suffer from digestive problems or other problems that you believe are triggered by your diet, don’t give up. There is an answer for you. The symptoms called IBS are something we deal with every day at the IBS Treatment Center. Regardless of whether a patient has been formally diagnosed with IBS, or just has the symptoms, we try to identify the cause or causes. Some people have these symptoms, at least in part, because their bodies are intolerant of gluten. Contact us today for a consultation.